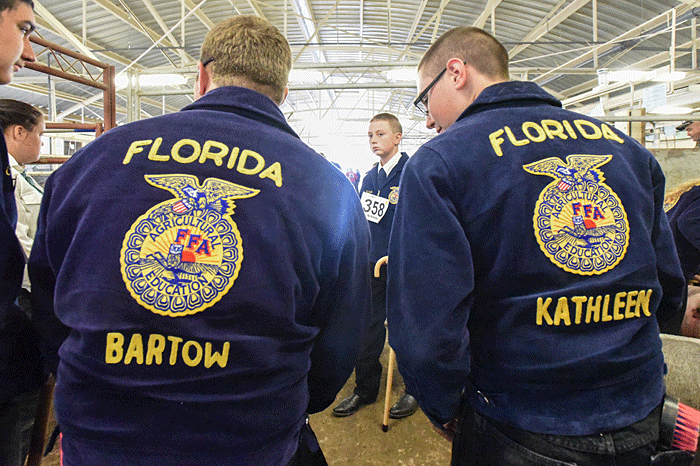 Native to Polk County, Mrs. Jessica Kennedy is going on her fifth year of being an ag educator. She currently teaches at Lake Gibson Middle School and her favorite part about it is being able to have interactive learning fun with her class both inside and outside. If you are a Lake Gibson Shark, be on the lookout for a watermelon-eating contest at the first FFA meeting. That sounds yummy! I might just have to stop by and be a Shark for the day! The “Dawgs” down in Frostproof will be having a membership roundup week — M&Ms Monday, Twix Tuesday, Whoppers Wednesday, Tootsie Pop Thursday, and Pizza Friday! So, if you have a sweet tooth that week, go see Mr. Brantley in the Ag department and he can fix that! Coach O and Mr. Reed are the two ag teachers at the Haines City FFA Chapter. Coach O is also known on the campus as “Mr. Fish Farmer.” He is going on his fourth year of teaching agriculture and loves it! He enjoys getting new members involved in FFA and starting up new Career Development Event (CDE) teams. Coach O is also very involved in aquaculture and has started an aqua-ponics system in the Ag shop — hence the nickname. This is Mr. Reed’s 30th year of teaching Agriculture at Haines City High! Mr. Reed is a HUGE Oklahoma cowboy fan, so if you want to get on his good side, mention your deep love for the Sooners! The diehard cowboy fan loves teaching his students about cattle and the veterinary assisting side of agriculture, especially the medical terms, prefixes, and suffixes. The officer team at Haines City is hosting its annual Wacky Olympics as a way to introduce students into the blue and gold world. Some past events held at the Wacky Olympics include the cow tongue pass, musical feed pans, a muddy obstacle course, a paint slip n’ slide, and so much more! If just those few examples don’t make you want to find out what neat thing your FFA chapter may be doing, then I’m not sure what will! Take time to inquire in the office at school, ask around to your classmates, or look for posters that may be hung up around campus. That wraps it up for this month. Don’t forget to “like” my Facebook page, Ag Time with Abby. I will be posting more events as I find out about them. Until next month … and don’t forget: As you are overfilled with excitement that Starbucks has brought its Pumpkin Spice Latte back to its menu (now with REAL pumpkin) — thank a pumpkin farmer! ABOUT THE AUTHOR: Abby Crawford is currently enrolled at Warner University, majoring in Agriculture Studies with hopes to go into the agriculture education or communications field. She is the former president of the Haines City High School FFA chapter as well as the voice behind 97 Country’s segment, “Ag Time with Abby,” which airs the first Friday of every month during the Breakfast Club with Roger and Melissa. Abby is also the 2014 Polk County Farm Bureau Youth Speech Contest Winner. For questions, FFA news, or FFA story ideas, email Abby at abbigailreis@gmail.com.